Barry, a CNC machinist, had been suffering badly with painful contact dermatitis brought on by exposure to industrial lubrication as part of his job as a computer numeric controlled (CNC) machinist, using precision machinery to manufacture automotive parts. He has been an engineer for 40 years and at his current job for two and a half years. The lubricant is used when tools are put into the machine – machine setting – and, in spray form, for cooling the machine to help counteract friction during the manufacturing process. Nitrile disposable gloves were provided to employees, but in most cases were not being worn because they make the hand sweat. These gloves were only habitually being used in extreme cases to protect the hands from oils. In addition, workers often caught their hands when setting the machines and handling newly-machined non-deburred components that can cause light cuts to the fingers. Barry had tried a myriad of gloves, many at his own expense, but was becoming increasingly uncomfortable and distressed by the pain in his fingers resulting from dermatitis. There are an estimated 17,000 people in work in the UK with skin problems they regard as caused by, or made worse, by work. Over the last five years, there were an estimated 7,000 new cases of self-reported skin problems each year that were caused or made worse by work 1, although this figure is thought to be vastly under-reported. OSDs are amongst the most significant health and safety issues facing industry. They threaten health, safety and efficiency in the workplace and the mental and physical wellbeing of affected workers. Machine oils, oil-based substances, greases, solvents and lubricants can cause occupational skin disease. Metal working machine operating is one of the occupations that has a much higher dermatitis incidence rate than others at 43.7 cases per 100,000 workers per year1 Exposure to these substances must be avoided. This situation, which had lasted more than seven months, had a huge impact on his life, both in and outside of work, and seriously affected both his physical and mental health. “Physically, it made me unable to do my job at times, as the pain in my fingers was unbearable,” he recalls. He had visited his doctor many times and became very depressed because of the pain, and the frustration he felt because his fingers were so awful. He is receiving treatment for this depression. To alleviate his symptoms, Barry had bought and tried a large number of gloves, plus had tried barrier creams, cotton undergloves and latex gloves, but nothing helped. Although he was quite ill due to the steroids he was taking for the pain, Barry still went to work, taking only a couple of days off when his distress was particularly bad. “I had just been coming to work and suffering,” he recalls. One of uvex’s sales managers was invited in to the company to try to help. 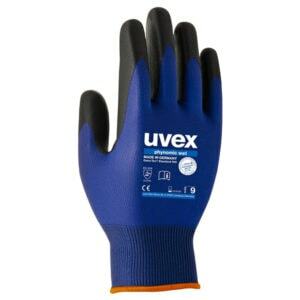 He recommended that Barry trial the uvex phynomic wet glove, which features a highly breathable aqua-polymer coating ideal for wet and oily conditions, to replace the nitrile disposable gloves. The phynomic offers superior protection, precision, breathability, comfort and cost-in-use savings against the disposable gloves and ensures excellent grip in slightly oily applications. Certified to EN 388:2016 4131, the phynomic wet has very high abrasion and, perhaps most importantly in Barry’s case, boasts excellent skin tolerance, confirmed by the proDERM Institute for Applied Dermatological Research, which ensures that the coating is also pure and is kind on the skin so that wearers are less likely to experience any allergic reactions. The phynomic is certified free of harmful substances in accordance with OEKO-TEX® Standard 100 and conforms to the uvex Pure Standard. Barry started to trial the uvex phynomic gloves in December 2018 and saw a vast improvement in all his symptoms almost immediately. He experienced an improvement in comfort, sweat control, grip, durability and overall performance. The gloves improved his skin condition so much that he also wears them out of work for driving, DIY at home, or just about anything.